“The 5th Revival Fukushima Renewable Energy Industrial Fair” was held in the Big Palette Fukushima in Koriyama from October 19th to 20th in 2016. According to the announcement by the organizer, 6,809 people in total visited the venue in two days. 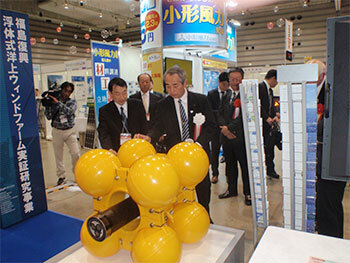 Fukushima Offshore Wind Consortium participated in this exhibition in order to introduce the world’s first offshore floating wind farm demonstration project broadly to people in and out of Japan. Approximately, 1,230 people visited the exhibition booth of the consortium in two days. 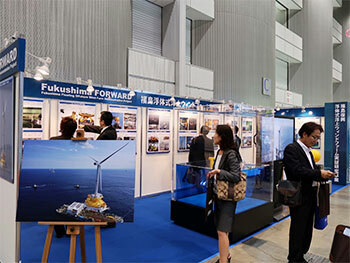 At the booth of the Fukushima offshore wind consortium, a large display showed movies of the construction record of the demonstration project, and the power generation of the 2MW wind turbine. In addition, a scale model of the semi-sub floater with 2MW downwind turbine was displayed. The visitors realized the completion of the largest offshore floating wind farm in the world from the panel of “Fukushima Hamakaze” installed in the planned sea area in this August and other three floaters already under operation. Also the panels on the research issue of the maintenance toward commercialization were displayed. A lot of voices to expect the commercialization after the demonstration came out from the visitors.